For second consecutive summer, I barely wetted a line. Seriously? What the hell is wrong with me? A so called fish junkie hanging it up for another summer? 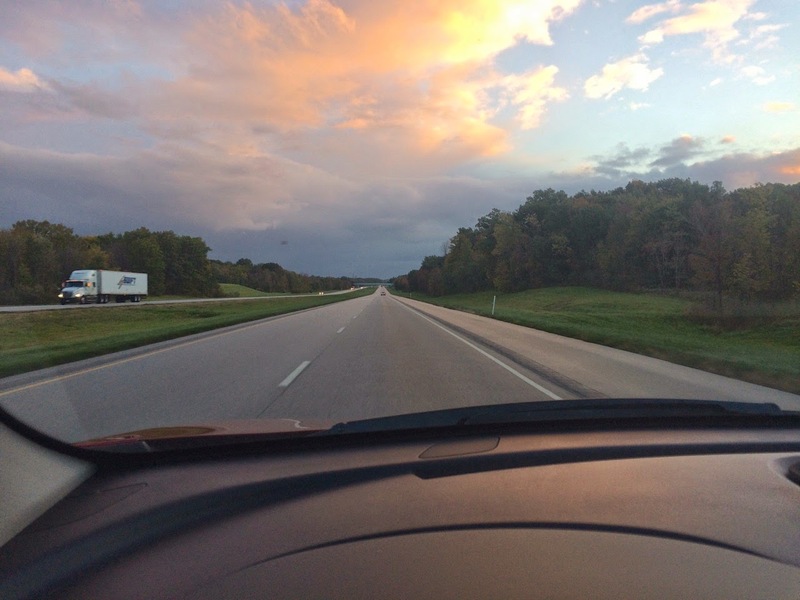 Chalk it up to work and road trips during the weekends. I've come to accept that I'm a one species angler. There's no steel during the summer, unless I get a boat. It doesn't really matter as summer goes by so fast that suddenly the cool winds come across Lake Erie ushering the end of summer. The nights get a little chiller and the days shorter. My steelhead clock inside my head goes off. I go into closest and dust off the rods and reels. The waders and boots could use a good cleaning. I inspect the tackle box to see what I need to order. The grind usually starts a week after the Labor Day weekend. Unfortunately the Alley was in dire need of rain. It seems to be a problem every year - a lack of rain. Rain dances or sacrificing a goldfish never seem to work. The rivers are bone dry, so I'm forced to fish off the piers. Several times out it didn't produce anything and I attributed that to the non stop boat traffic coming out the Grand River - fishing boats, pleasure boats, muscle boats and jet skis constantly roaring by. Finally we get some rain, but not enough too blow the rivers. The first trip out was Conneaut and it was nice to see her again. Despite being low, she had a dark tea color. Hopefully within that dark water were some steelhead. 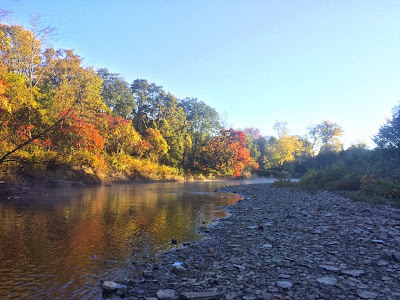 With it being so early in the season, I didn't even bother getting to the creek at first light. I arrived around ten in the morning and some anglers were coming off the water. Some wanted to get home to watch the Browns, who have seem to turn the corner after a long decade of losing. For years I hoped the Browns would be a more competitive team because meant a lot of guys would leave before noon, clearing out space. The creek turned out to be a lonely place as I moved from pool to pool. The trees were still green and it felt like fall was a long way off. As the sun crept higher, it became more evident that my chances of catching a fish was becoming nil. In sixteen years, it was a first for me - no steel in the month of September. Getting up early has been a struggle as I've often slept in during the summer. I couldn't remember the last time I got up at five in the morning. I groan as I hear the alarm go off. In my stupor, I slam the night stand trying to make contact with the clock. The lamp falls over and I finally hit the snooze button. "It's early October, no need to rush"
Not wanting to get into bad habits, I fight the urge to sneak in a few more minutes. On the road back to Conneaut again as I'm still tired. The grind can be hard early in the season. I arrive at the lower Conneaut and there's a couple of cars. On the way down I peek to see nobody fishing under the bridge. I seize the opportunity and quickly drop a line. Knowing the hole very well, I fish the tail end as it's deeper. I quickly get into a couple of fish and both are fairly small. Sure enough, I look over and see a couple of anglers heading towards me. I'm not concerned because I know the number of fish in the hole are small. I'm content yielding the hole as I have more water to fish. We exchange greetings and I head upstream. I fish the lumber pile in one spot and nothing. Early season steelheading on the Alley requires a lot of walking. I continue to walk upstream passing shallow riffles and pools. The water is clear enough that I can see the shale ledges. I arrive at a run that cuts along the bank. It's just deep enough to give a steelhead or two cover. I make the adjustments on the float and sinkers and start to work the water. I drift along the bubble line and I see the float tap and go under. I set the hook and watch a fish leap from the water. It was a furious but brief battle and I beached the fish. She was a beautiful plump hen starting to her darker colors. I grab her tail and pushed her back into the deeper water. She bolted hard and headed back to where she was hiding. I continue to walk further up and one pool didn't produce any fish. I look up towards the tressel and nobody was there. 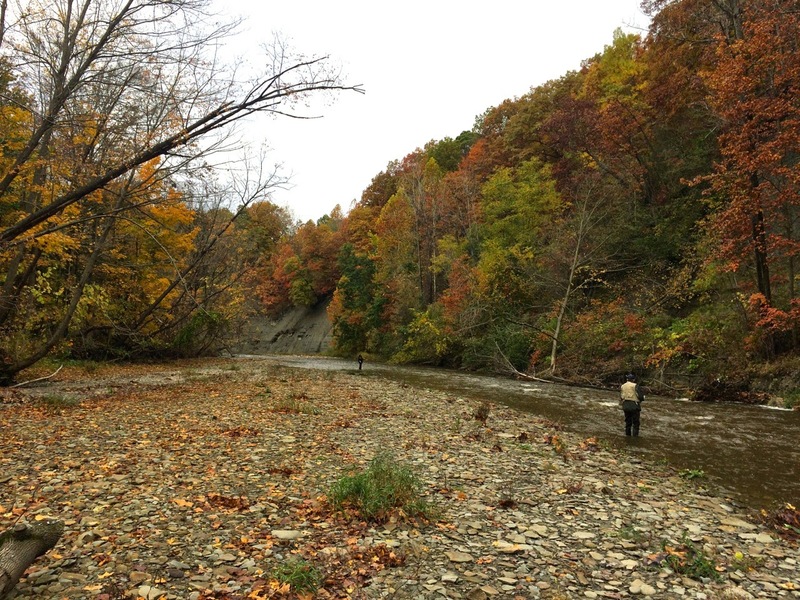 The tressel is a tricky place to fish and only fishes at certain flows. The pool is nothing more shale, but the ledge drops sharply. At higher flows the current is too strong as the hole is not very long. Today the flow is slow enough that I get my presentation down. Standing on the edge directly below I feather the float along the ledge. I kept working further away as I wasn't sure where the ledge directly dropped off. 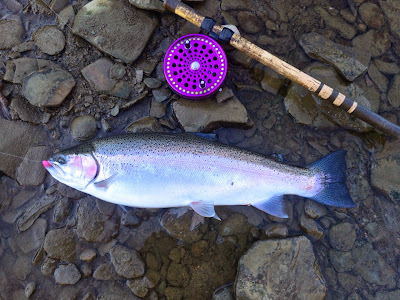 Steelhead love to hide right along the ledges. The float pops and I feel a hard surge. It's a larger fish as I see come to the surface. It will difficult landing it as the cliff is behind and there's hardly any room to beach it. The fish finally gives up and I pull it along the rocks. It slides along and rests. The fish seemly wants to cooperate and I quickly yank the hook out. I slide the fish back and it slowly swims back into the depths. More walking and my feet start telling me enough is enough. My heel starts aching and my back is getting sore. The grind can take a toll on the body, especially somebody who just turned 46 years old. The bite has turned off and my grumbling stomach tells me fishing time is over. I'm almost 3 miles from the car. By the time I get back to the car, I've worked up a sweat and I let a huge sigh of relief when I take off my waders and boots. It's 85 miles to get home and I'm fighting to stay awake once I reach Cleveland. Once I'm home, I literally fall on the bed and I'm out for the rest of the afternoon. This week, I need to hit the road earlier as I'm heading out to Elk Creek in Pennsylvania. The Elk blew out the day before and was frothing at the mouth for some real action. I quickly wolfed down breakfast and hit the road as it was a 100 mile drive. I set the cruise control to 75 and listen to some Pink Floyd's greatest hits. I arrive at Folly's campground and I'm the seventh car in. I quickly dress and make a bee line for one my favorite spots. As expected people are cluster under the bridge and I slip behind them and into the woods. The creek is still stained and I wonder how many fish are in the creek. I make to the cliffs and I immediately noticed that the pool has changed. The gravel bar is gone and pool has narrowed. I start banging away and for the first 20 minutes I have nothing. Most of the time on the Elk, I've caught a fish on the first drift, but 20 minutes? It feels like an eternity. I'm left scratching my head as I start walking away. I reluctantly walk away and head back downstream. Now there's another problem - other anglers. I can see people clustered around the riffles and pools. The water is stained enough that fish can't be seen. I pick off a couple fish from a long sweeping pool. 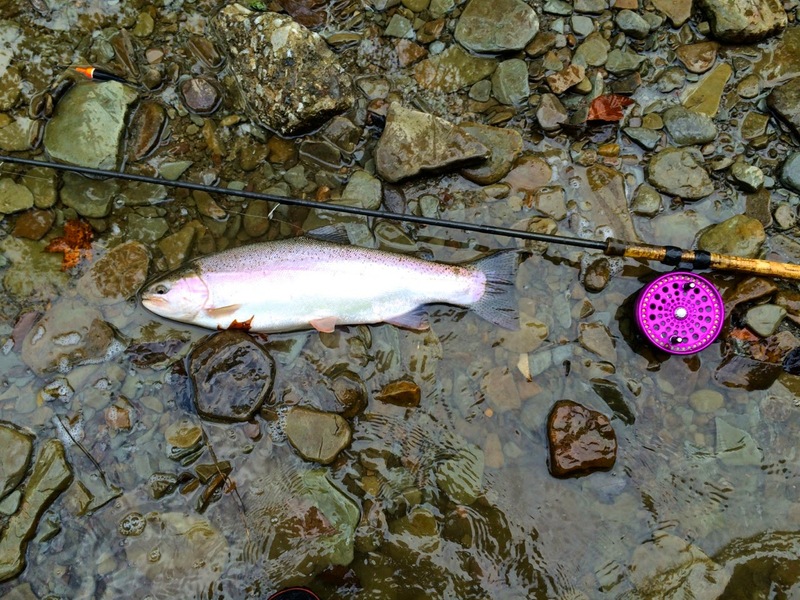 The fish were hold along the shale ledges and I worked the pool over. Something isn't right as I'm catching one or two fish. I get closer to the fly shop and I see the same people I ran into early in the morning under the bridge. The glum expressions are telling as the fish are few and far between. With eight people behind the fly shop and I walk by and cross over. 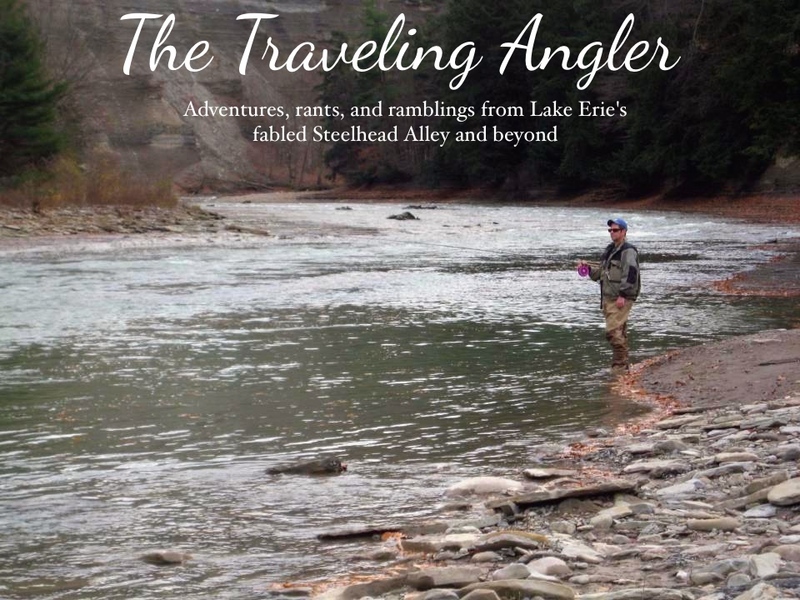 I hit a small pool with the hopes that some of the worst steelheaders failed to get one fish to hit. I was lucky enough to yank one out of the pool. I grind all the way down to the posted property and I had three fish. That was remarkable considering the sheer number of people. The total for the day - 7 fish and in past years I can pull 7 seven in one pool within 30 minutes. Something isn't right in Steelhead Shangri-La. Once home, I rest my sore feet, knees and back. Within minutes I'm dozing off as I struggle to watch the football game, the Browns seem to have that effect on me. Eventually, I'm out for the count and snoring away. A week off to rest and it's back to the grind.